You’re Just 3 days away from the Pro-rated HVUT Form 2290 Deadline! Truckers, you all know very well that the Annual HVUT Form 2290 is generally not due until July. 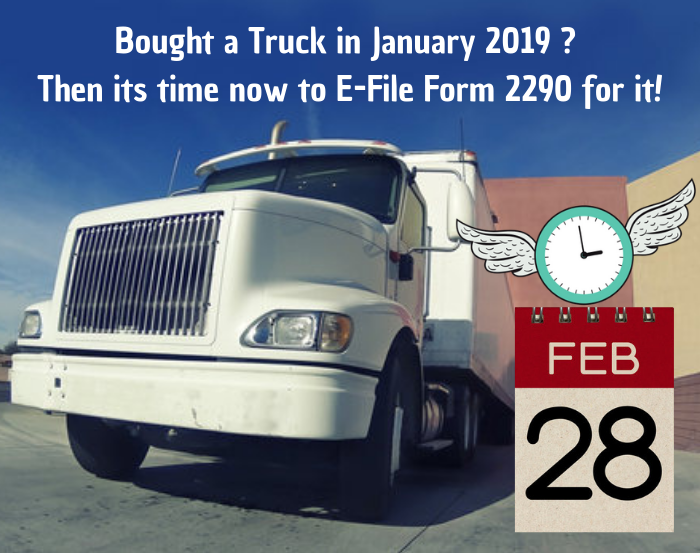 However, did you know that The Federal law states the Form 2290 must be filed by the last day of the month following the month of its first use? Now based on this law, the Pro-rated HVUT Form is now due by February 28, 2019 for vehicles used since January 2019. This pro-rated HVUT deadline has no impact on the 2290 annual renewals which are generally due by June and which is payable until the end of August 2019. The HVUT Form 2290 is basically an annual tax paid to the Internal Revenue Service on Heavy Vehicles which is said to have a minimum gross weight of 55000 lbs (Weight of the Tractor+Trailer+Load Carried) and the subjected vehicles are used on the public highways for its desired purpose. However, the taxes are determined based on the number of miles the vehicles covers within the respective tax period it’s been reported. If the vehicle is expected to be driven over 5000 miles (For commercial based units) and 7500 miles (For agricultural based units) the tax payment needs to be made full in advance. Whereas if the vehicle tends to remain under the mileage limit then No Tax Due is imposed on the vehicle as it is declared to be an Exempt vehicle by the Internal Revenue Service. Truckdues.com is rated to be one of the most unique honest priced websites in the market which offers HVUT Form 2290 filing service at a much affordable cost. E-filing begins here as low as $7.99. Receive the IRS digital watermarked copy of Schedule 1 in your registered e-mail address within minutes after e-file. Reach our tax experts @ (347) 515-2290 for your HVUT Form 2290 needs. This entry was posted in 2290 e-file, EIN, Form 2290 and tagged 2290 form site irsgov, 2290 form us irs gov, dot form 2290, Efile form 2290, form 2290 pay taxes location, form 2290 penalty, form 2290 where to mail, fuel excise tax form 2290, highway usage tax form 2290, internal revenue service form 2290, who needs to file form 2290 on February 26, 2019 by Truck Dues.